A culmination of the Spring/Summer 2002 concert series. 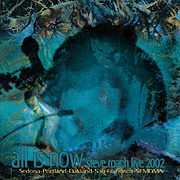 Fresh from concerts in 2002, this purely live double-CD release will present the current evolution of Steve’s iconoclastic live experience captured at select U.S. dates earlier this year. For the duration of the first half of this year, Steve was on a constant program of performing on the road, then returning home for a few weeks at a time, setting up the live system in The Timeroom to create new sounds and reflect on previous concerts. This proved to be a refreshing alternative to the “tour-’til-you-drop” approach as the evolution of the music and soundworlds were greatly enhanced by this process. Elements from Core, Streams & Currents, Early Man and InnerZone will be felt, but the spontaneous moments within these two CD’s, along with many new pieces and spaces created just for these events, gives this experience an atmosphere than can only come from stepping out from the safety of the studio environment. From the intimate to the immediate, the intensity of these sound journeys with the audience onboard is clearly captured and alive. The “mobile Timeroom” events were recorded at Sedona Arizona, Oakland and San Francisco California, Portland Oregon, and the SFMOMA / Yoko Ono event.